While growing up, the best experiences of my life were the outdoor experiences. My daycare is only a block from our town’s major highway, but I’m blessed with a large backyard and knew I wanted to offer the children in my care as much “country” as possible. I saw a video of a Nature Explore Classroom and immediately searched for the nearest training offered in hopes that it was what I needed to support my outdoor project. I was not disappointed. I quickly began making decisions on how to make the program standards work for us. Areas were designed to increase a love for learning and play. The children were asked what they love about the outside and those responses were used in the planning process. As we proceeded, their play was facilitated by the requested items which enhanced their imaginations and allowed them to take a closer look at nature. 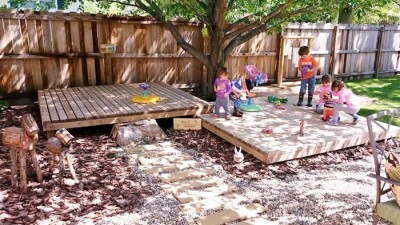 Upon entering our outdoor classroom, children may take the path to the right which crosses a wooden bridge to our playhouse or dramatic play area. 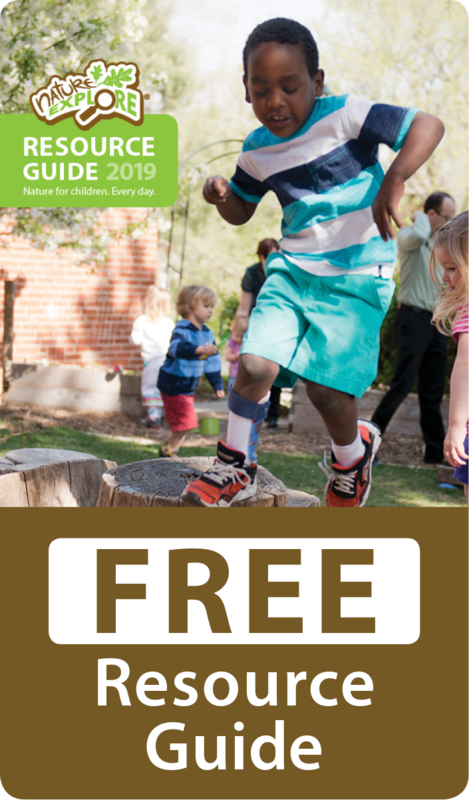 If they choose to go left, they may see what’s happening in the Music and Movement Area and opt to play a tune at our sound wall or dance on our raised platforms where dramatic plays are often held. Straight ahead from the entry, children may be building large creations with our outdoor wooden blocks while other children are enjoying our Messy Materials Area. In the back of the classroom, there is a Nature and Art Exploration Area with boxes holding a collection of recycled and natural objects which may be used to support imaginative play or for arranging on a designated table. We also have a large weaving loom for these special “treasures”. An easel in the Art Area is available for children to paint outdoors, where mud is a favorite medium. Storytime often takes place in our outdoor Gathering Area close to where children help in the gardens. Drought resistant grass has been planted in the Active Play Area, which hold up to many running feet. The worm bin allows children a space to dig into rich dark soil and discover the wonders of decomposition. A large swing set, dynamic play area and ride on cars are also available in this space. Two mature trees shade much of the yard while other plantings provide color and texture to our environment, reminding us of the beauty of nature. Our outdoor classroom is a special place, lending many enjoyable ways to spend time interacting with nature. Both children and parents have experienced this transformation from an ordinary outdoor play area into a magical garden. Parents enjoy observing their children’s discoveries and creations through pictures and accompanying them around the Nature Explore Classroom during pick-up time. This has been the most positive addition to our daycare family to date and is only in the beginning stages as more nature and nature inspired activities and environments are planned in the future. We offer tours to encourage and inspire other facilities to start incorporating natural elements into their settings.